We had a bit of a late start, I was feeling better but Monica was not. We didn't set out until early afternoon, but we got to see the Taj Mahal, and it is truly one of the wonders of the world. 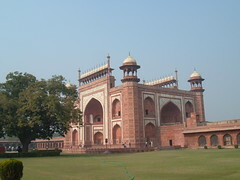 The gateway alone is worth seeing in it's own right, but it pails next to the Taj. One parks some distance from the Taj Mahal and there is an electrical bus to take tourists the final stretch. This is an anti pollution measure, of course, there are lots of people offering to act as guides. Our guide was pretty good, but in hindsight we should have said goodbye at the Taj, as this would have freed us to explore alone, and still allowed him to look for the next punters - we didn't need him to take us back. The Taj Mahal was built as a memorial for the favourite Maharani of the Maharaja of Agra, a monument to his love. The building is perfectly symmetrical, with a mosque on one side, and, to keep the balance, a whole seperate building on the other. This building can't be used as a mosque as it's facing the wrong way. 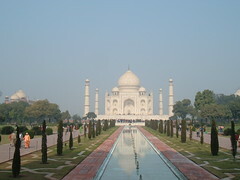 The Taj Mahal is finished in white marble, and at the top is a massive single stone lotus flower. To get it up there they made an earth ramp some 2km long, and hauled it up there with elephants. This represents a phenomenal amount of manpower. On the far bank of the river we could see the foundations for what would have been the black Taj, this would have made a fourfold symmetry - the black Taj would have been the tomb for the Maharaja himself. It would have been black as he wanted to be in her shadow. 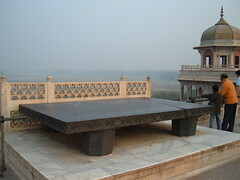 Unfortunately, his son had seized power and the political situation was such that the Maharaja spent his dying days in Agra Fort, within site of his love at the Taj Mahal. If you plan to visit the Taj Mahal, it should be noted that foreigners pay more than locals. Personally I have no problem with this given the differences in the average wage. Also, you will need to travel light. You are only allowed to take in a limited number of items. We took a camera and water. 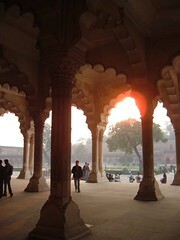 From the Taj Mahal we went over to Agra Fort, this is a huge complex and only part of it is accessible to the public. There's a huge throne there, and one can see the rooms where the old Maharaja spent his last days. At the fort there was a rope which went to street level, if any of the commoners wished they could seek an audience with the Maharaja by pulling on the rope which rang a bell to alert him. Somehow I can't imagine that working today! Oddly, moving around the fort there were several people who asked if they could have their photos taken with Monica - this was just weird. Monica was pretty beat by the time we got back to the hotel, we ended up watching Star TV, a submarine film called 'Below', and 'True Lies'. I made Monica eat something and she opted for the 'blandest thing on the menu', fish and chips.